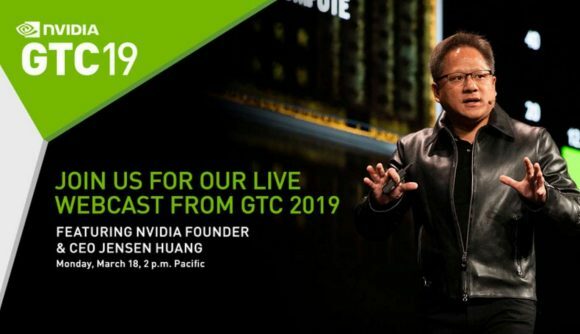 Tune into Nvidia CEO, Jen-Hsun Huang’s opening GTC 2019 keynote livestream right here… it kicks off in just a few hours! We’re moving into the busy period of PC hardware, with both the Game Developers Conference and Graphics Technology Conference starting this week. And one of the biggest events on this busy Monday will see Jen-Hsun delivering the opening keynote address of its 10th annual GTC event. Taking place at the San Jose State University Events Center today, just a few hours down the road from the GDC party, the keynote is being livestreamed for all of us to enjoy, and you can watch the whole thing from the safety of PCGamesN below. Jen-Hsun will take the stage at 2pm Pacific time, which is 9pm GMT and 10pm CET, but we’ll save you a seat. So, what’s he going to be talking about? The more high-speed data interconnect companies you buy the more you save? Maybe. But you can also expect to hear a whole lot more about ray tracing as it’s still something Nvidia desperately needs to convince the world is a thing for gaming. And, as the event is almost piggy-backing GDC, you can expect to hear more gaming-centric announcements than you might otherwise get out of a GTC event. Nvidia’s Graphics Technology Conference is normally restricted to news about the enterprise, data centre, machine learning, automotive sides of Nvidia’s business and less about the fun GeForce side of the equation. What about new graphics cards? Jeez, greedy much? Nvidia has only recently released the GTX 1660 and GTX 1660 Ti cards, and you want more? Of course you do, that’s what we do. And there have been rumours that Nvidia might start to make more noises about its plans for 7nm GPUs – though that at least will likely be restricted to the professional side. We have also heard rumours of a 7nm Turing refresh later on down the line, but nothing more concrete than whispers in the wind and Samsung’s assertions that Nvidia is one of its 2020 7nm EUV launch customers, with sampling beginning to ship this year. There has also been some speculation that the Ampere codename may rear its head once more, though that is even more spurious a rumour than the suggestion that 7nm parts might get a mention. But you can find out all the details first hand by tuning into the embedded livestream above at 2pm PST | 9pm GMT | 10pm CET.